Social networks have long relied on the kindness of what are essentially strangers in order to thrive. You might be thinking I’m talking about the people that use them, and I am. But I’m also referring to two other constituencies of social networks that are nearly as important and which happen to be vital for their long term growth and health: Developers and advertisers. That’s not all either. As a social networks get larger in size and longer in the tooth, they must add employees and venture capital firms to the mix as well, who want good returns on their time, effort, and investments. These groups end up pulling the business in different, competing directions. However, the tension resulting from the cross-purposes between all of these constituencies isn’t really surprising. After all, social networks — like businesses — are themselves made of people. Differing agendas, objectives, and priorities are part of the mix, like any community of individuals. But of all these, it’s developers and advertisers that are coming into focus recently as moves by popular social networking services such as Twitter have begun alienating the former as they appear to proactively cater to the latter. In particular, this week’s scrubbing of 3rd party app source names from tweets means that Twitter is essentially white-washing its developers’ app presence from its feeds. What does this mean exactly? Going forward, when one posts to Twitter from Hootsuite or Tweetdeck or Instagram, no one will be able to tell which app was used. 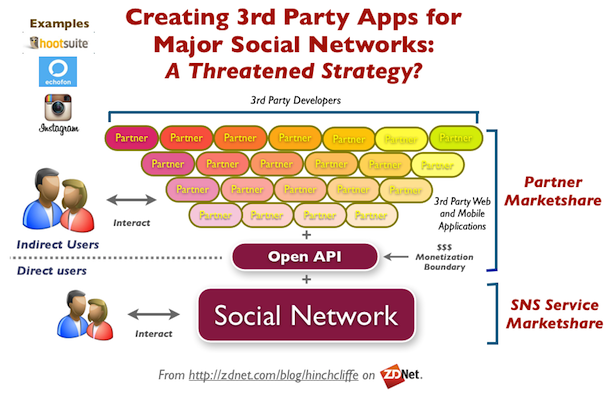 3rd Party Apps for Social Networks Like Twitter and Facebook: A Threatened Strategy? While the source of the app that posted a tweet may not seem very important to users, it’s critical for a developer that has spent their time and money creating a new type of Twitter client and relies on its visibility to succeed. And this where the rub is, because developers were arguably instrumental in building Twitter into what it is today. When I talked with Alex Payne, Twitter’s API lead, back in 2009, he reported nine out of 10 users of the entire service were already using 3rd party clients to post and consume tweets. Developers had literally became the public face of the service for most users. What’s more, they helped provide the myriad user experiences and features that no single company could provide by itself. Now that the service is enormously popular, with over 500 million registered users as of this year, Twitter apparently wants to deal itself back into being the primary intermediary with the user. Increasingly restrictive rules for what developers can do continue to be announced. For its part, Facebook has also lowered the boom several times on those that helped build it out in its early days, when they needed every 3rd party app they could get back in 2007 to propel them past MySpace, the market leader at the time. Of course, as I observed as Facebook prepared to go public, the dual opposing pressures of protecting customer privacy while endlessly inventing ever more sophisticated ways to monetize their data was going to be a tall order indeed. For the most successful social networks today, both of these issues will ultimately end up penalizing 3rd party developers that have invested in the platform. At the same time the host social networks will end up trying to preserve the most valuable aspects of the data only for themselves. Those who’ve following my writing over the years knows that I’m quite bullish on strategically using open APIs as a way to scale partnership and harness innovation as cost-effectively as possible. It’s a brilliant strategy for startups, and the smart use of open APIs directly led to the success of Internet giants such as Amazon, Twitter, and Facebook who’ve all used them to rapidly create marketshare, network effects, and vibrant partner ecosystems. Today, few startups launch without an API coming a short while later. But the end game for 3rd party developers seems increasingly bleak for social networks, at least how the services are designed as businesses today. Where will the innovation in social go? Then there’s the issue that the current social networking monoculture, where the vast majority of people are using a few large services, hasn’t changed much recently. Because of this, I think a strong argument can be made that they have inherently begun to limit innovation and create stagnation in the marketplace as they attempt to consolidate control. But with the recent provocations to developers (API restrictions) and users (privacy concerns) and the rise of a some compelling competing services, it may not be situation that lasts very long. Yesterday afternoon, for instance, Twitter slapped new restrictions on developers who make apps like HootSuite, Tweetbot, and Echofon. Their user count has been capped: if they have, say, 10,000 users at the moment, they can’t exceed 20,000. There are new display guidelines that turn out to be mandatory, with Twitter threatening to “revoke your application key” — the Twitterverse’s death penalty — if they’re not followed. Unfortunately, even just the talk about suffering a social networking “death penalty” is enough to make loyal business partners — which is exactly what developers are — think twice about investing any more of their funds, time, resources, and reputation into someone else’s ecosystem, for it all to be taken away capriciously. Users themseleves largely won’t care much about this situation, unless their favorite 3rd party app is restricted in some way. But they’re increasingly wary of their private data being held captive and exploited. This is confirmed by the new Wave 6 report on social media usage in 62 countries, which noted recently that concerns about how much of their personal data is kept on social networks upticked sharply in the general public. While the current monoculture of major social networks seems unlikely to change soon — note: there are still nearly countless (and growing) numbers of minor ones — the rise of Pinterest in the U.S. and Sina Weibo and Renren in Asia, shows that there’s still room for more. As large social networks cater less and less to the 3rd party developers that helped make them successful, this will create openings for hungry new social media startups willing to tap into the crowds of developers looking for easily tapped fertile new ground. However, it still remains to be seen what a developer backlash will truly mean, other that shifting developers into creating their own social networks. In fact, one of the more interesting experiments along these lines is the new service App.net, which is a new Twitter competitor that claims to put users needs first and foremost. Note: By users it seems to means both end-users and developers, a smart move in my opinion. App.net story is interesting and is riding the crowdfunding trend, meaning that it has legs from real people who are putting their own money into it. The service recently raised over $800,000 from over 12,000 contributors. More importantly however, is that there are already over 40 mobile and desktop apps available after only a few weeks, showing a similar developer appeal as Twitter did in the early days. How will they make money without being beholden to advertisers? Users must pay to reserve their user profile and developers must do the same for API access. What makes it special though, is that App.net is a new way to structure a social network that doesn’t have the inherent contradictions that the major players have now. Whether it is ultimately successful or not, I suspect it’ll help prove that there are alternative — and perhaps much better — ways to design the business models of large-social social network services. Related: Should companies drive their traffic to Facebook? How do we resolve the tension between user privacy and data exploitation? So what are the real lessons here? One, that social networking is a business, just like any other. It must have revenue to pay for the servers, talent, and network bandwidth to scale up as it grows, just like any cloud offering. Second is that long-term data ownership and controlrepresents the competitive landscape of the 21st century. Finally, the first and second points make an extremely slippery slope from which ultimately even the best market leaders can fall. I think the juggling act to ensure users, developers, advertisers, and the service itself are happy (you guessed it, pick two) is going to be a painful one to watch play out in the social business era. Perpetuating the current model practically invites responsible entities, such as governments, to create a patchwork of laws and regulations to try and solve the problem. Not surprisingly, these laws and regulations already exist in many countries and more are likely. In fact, success may ultimately be only be achieved by a few adroit and savvy companies that can find a new way forward. Organizations betting on social can learn a lot from watching all that happens here. Great article here. I did notice that Twitter was removing the applications that served up the content to their website. However, I failed to see the marketing implications from the other side of the coin. Do you think that developers will start consuming some of that 140 character space for 3rd party application branding? It might be the only way to go, or to selectively place an image with any tweet to show that it was sent from a particular application? Interesting stuff here.